Learn how to quickly uncover and leverage employee stories to create your employer brand messaging. 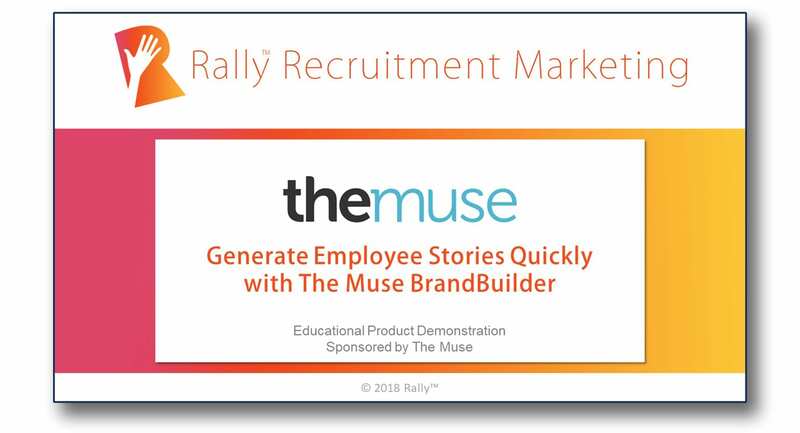 Hannah Sackett, Product Marketing Manager from The Muse, provides the Rally community with an overview their BrandBuilder product and demonstrates how it simplifies any complicated and time-consuming employer brand project. Demo length: 30 minutes. There’s a reason why we as consumers of any product or service rely so heavily on the reviews or feedback of others before making a purchase. It’s raw and authentic feedback that we can trust. Why are employee stories so critical to employer branding, and ultimately, attracting candidates? What sets BrandBuilder apart from other tools or just doing it yourself? How can you leverage the information gathered by BrandBuilder? The Muse strives to make work more human by being a trusted resource for millions of people as they seek career satisfaction—not just another job. Companies partner with The Muse as they look to attract and retain the best talent by telling an authentic and compelling employer story. Our mission is to create meaningful connections between companies and candidates to make the world of work—from the job search to career development—more personal. To learn more about BrandBuilder, visit https://www.themuse.com/employers/brandbiulder.